Stop your world for a moment, get in touch with your feelings and imagine that you are an Apollo astronaut standing on the moon. Your fellow astronaut is nearby inside the lunar Lander and you are out there all alone, in your spacesuit, standing on the powdery, barren surface of the moon. It is beyond eerie. It is unearthly, alien. No amount of training could ever have prepared you for the way you are feeling right now. Your heart is pounding. The landscape is stark and flooded with a searing light. With no atmosphere, the stars blaze all around you in a black sky like headlights pointed straight at you. You can see the earth above (below? ), hanging like a light blue tree ornament in the perpetual night. You can almost reach up and touch it. Your family is there, so near yet so far. If the rocket on the Lander fails to ignite, you will die here. It is so unearthly quiet, you can hear the sound of your own blood flowing through your inner ears. You can almost hear the sound of your own digestion. You are truly and inexorably alone. Then the NASA movie director yells “cut!”, you lift off your helmet and head out the hangar door for lunch with the rest of the crew. Whew! I had you there for a second. Now get in touch with your imagination again, and this time pry your mind open as w-i-d-e as it will go. Turn your truth detector on “high” and consider the outrageous, the impossible: that NASA never actually landed a man on the moon. That they faked it in a simulation filmed entirely inside a floodlit hangar here on good old terra firma. Impossible!, you say. 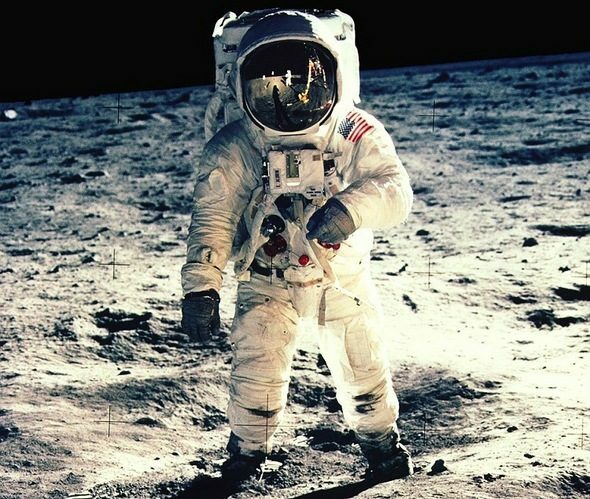 I mean, if you’re over about the age of 40, you can most likely remember exactly where you were and what you were doing as Neil Armstrong spoke those most famous words in all of human history: “One small step for man, one giant step for mankind”. Fake it? FAKE it? Why on Earth (literally) would they do this? Hard digging investigative journalist, Jim Collier of “Votescam” fame, has now hung his credibility and perhaps his entire career on the question of whether NASA has actually “mooned” the entire world in the most colossal hoax of all time. The premise is that the pressure was on to beat the Soviets to the moon. Everything was at stake – F$30 billion in federal funding, prestige, egos, careers, the whole works. NASA knew how to send three men TO the moon and go AROUND the moon, but lacked the technical expertise to land ON the moon – to separate from a “mother ship” (the lunar orbiter), descend in a smaller, self-contained “shuttle craft” (the lunar lander), fire a 10,000-pound-thrust landing rocket and spiral down to a controlled landing, suit up, disembark, romp and play on the surface, go for a drive, return to the lander, blast off, rendezvous and dock with the orbiter and finally return to Earth. So they faked it. Considering that this was the same general era as Stanley Kubrick’s blockbuster “2001”, the special effects technology certainly existed. And you can make a lot of movie with a cool F$30 billion. In a recently released VHS video titled “It’s Only A Paper Moon“, Collier looks straight at the camera and in a “video letter” asks senior NASA management for proof of the accomplishment – a feat the entire world has long taken for granted. 1. Two fully suited Apollo astronauts could not physically have fit in the allotted space inside the lunar lander and opened the door because the door opened INWARDS, not outwards. They could not have exited with their suits on. He measures this on film. 2. An Apollo astronaut could not physically have fit through the tunnel connecting the orbiter and the lander. It was too narrow. Collier went to NASA’s museum and measured it. The ends of the tunnel contained a ring of docking connectors. NASA’s “in flight” footage that we are told was taken en route to the moon shows astronauts freely tumbling through this connecting tunnel which would be blatant enough except that there are no connectors visible, plus the tunnel hatch door opens the wrong way. Those shots were taken ON EARTH. 3. There is BLUE light coming through the spacecraft windows en route to the moon. With no atmosphere to filter through, space is BLACK. That footage was taken here ON EARTH, most likely in a cargo jet placed into a steep dive to simulate the sensation of “zero-G”. 4. Photos taken by disembarked astronauts show the lunar lander sitting on a placid, smooth, undisturbed surface. Impossible, if they blasted down to a landing, riding on a 10,000 pound thrust plume of flame. The entire area would be severely disturbed. Those shots were taken here on EARTH. 5. There are no stars in the sky in any Apollo photographs. None. That is impossible. The astronauts were surrounded by blazing white stars, unaffected by any atmospheric distortion. Those shots were taken here on EARTH. 6. There are multiple shadows projecting from the astronauts and from other objects standing on the lunar surface, shadows of different lengths. That is impossible. There was no other source of illumination besides the SUN, all of which (obviously) came from the exact same direction. Those shots were taken here on EARTH. 7. Earth never appears in a single NASA photo allegedly taken by an astronaut standing on the moon. Not one. If you were NASA, wouldn’t you want, for publicity purposes if none other, MANY shots of astronauts – maybe of every single astronaut – posing “next to” the Earth? Maybe even appearing to HOLD Earth in his upturned palm? 8. With 1/6 the gravity of Earth, the “rooster tail” of dust kicked up behind the wheels of the “dune buggy” (lunar rover) should have gone up SIX TIMES as high as it would on Earth when traveling at the same speed. But it does not. It also comes back down in sheets – SHEETS! That is impossible in zero atmosphere. The dust should have come back down in the exact same smooth arc it went up in. 9. The folded lunar rover could not physically have fit in the allotted storage space on the lunar lander. Collier went and measured it. The space is several feet too short. Shots taken “on the moon” show the astronauts STARTING to unhatch the compartment and remove the rover, but then cut away. When they pan back, the rover has been unfolded. How conveeeeeeenient! 10. The lunar lander crashed – CRASHED – during its only test flight on Earth. So why was it further test flown by attempting to land it ON THE MOON? If you were an astronaut’s wife, would you go along with that? 11. None of the Apollo astronauts has ever written an “I Went To The Moon” book or other such memoirs. Now ask yourself, if in fact we did NOT land on the moon and the American public ever discovers that fact, do you think their eyes and minds might be opened just a teeny bit to the HUNDREDS of already discovered and CONFIRMED acts of government deception? Such as the FACT that a Social Security Number is NOT required by law? How about the limited imposition of the income tax? How about Gulf War Syndrome? How about abandoned soldiers in Korea and Vietnam? Gee, how about the entire New World Order? NASA is stonewalling Collier completely. No response. No rebuttal. No denial. Just dead silence. Perhaps a few MILLION Americans should begin turning up the heat by asking NASA and their elected officials these same questions. But first, they simply MUST buy and view Collier’s video, “It’s Only A Paper Moon”. Oh, by the way, Grumman and Northrop corporations, developers and manufacturers of the lunar lander and the lunar rover, told Collier that all of the original blueprints and design records were destroyed. Not lost, misplaced or in the Smithsonian proudly displaying the history and development of this monumental feat of human engineering and accomplishment. DESTROYED.